Farnell delivered my Beaglebone this morning. The bone is powered up and running; I'll describe the startup process in a later post. 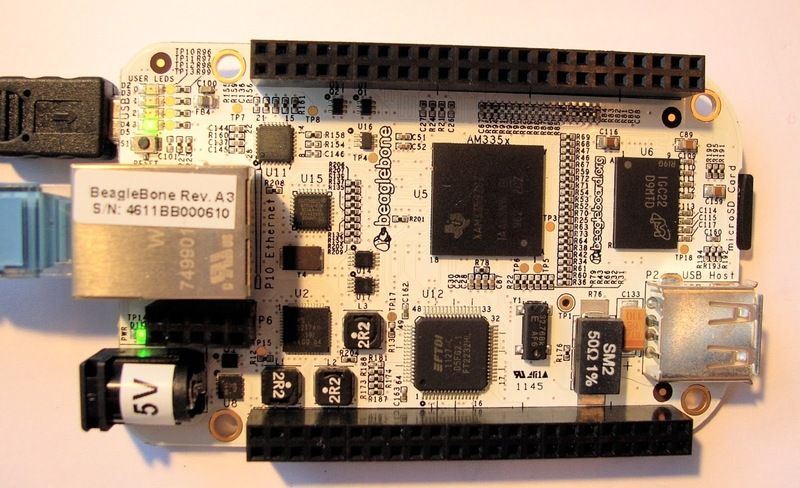 The Beaglebone is compact; the board is about 2.1" by 3.4", although the Ethernet socket protrudes by another 0.1". It comes with a demo image on a micro SD card already in its SD slot; there's a second micro SD card supplied, which I haven't investigated yet. Like the BeagleBoard, the Beaglebone comes with the Angstrom Linux distribution, but you've several other options, including Ubuntu. Unlike its big brother, the Beaglebone has no HDMI socket, so you cannot intereface the bare board with a DVD-I monitor. The bone will soon be supported by a number of Capes ( the Beaglebone equivalent of Arduino's shields), and one of these will provide DVD-I support. As you'd expect, you can connect to your board via the Serial USB link. You can also use SSH or VNC to provide a console or GUI session over Ethernet. However, the Beaglebone offers another exciting way to interact with the board. The environment comes with a handy demo (blinkled.js) which will flash one of the board LEDs on and off.The sample code below gives you a feeling for how easily you can create programs that will interact with the bone's hardware. The goal of the bonescript environment is to provide libraries that are simple to use (like the Arduino libraries) through a development environment that needs no installation. The libraries are a work in progress, but there's already enough to get the first wave of explorers off to a flying start. I love the Beaglebone. The documentation is still a bit on the scanty side, but the hardware, and the development environment, are inspiring. I'm looking forward to getting to know this great product much better over the next few days. One word of warning - it looks as if Farnell have already sold out of their first shipment, and I suspect the next batch will also sell out fast. You can place an order here.